A Disk Management Utility in combination with a viewer. File Viewer is a Disk Management Utility in combination with a viewer. Search your Computer for Pictures, Sounds, Music, Documents, Database, Spread Sheets, and Audio-Video Files. You can View, Print, or Send and Receive Files over the internet using E-Mail. A large number of Files can be organized in a database over a Local Network for quick access. Picture Editing with Copy / Paste. Copy files to another computer, disk, or external media. Batch Copy, Rename, Delete, Move, and Zip File Creation. File Viewer - Search for many common file types, or groups of file types, display, print, organize or send files over the internet. Find and Display Pictures, Videos, Sounds, Music, Text Files, Documents, Spread Sheets, Database, and System Files, Locally or over the LAN. Quickly view Pictures of BMP, JPG, JPEG, EMF, WMF, ICO, CUR, TIF, PCX, PNG, PSD, TGA, EPS, CUT, PCD, FPX, PBM, RAS, MAC, FAX, AWD, XPM, CLP, XWD, FLC, ANI, SGI, CAL, ICA and MSP format with thumbnails for a folder. View Text, DOC (Word), HTM, HTML, SHTML, SHTM, PDF, RTF, WRI, SYS, BAT, BAK, LST, INI, DOS, WPS, DBF (DBase, FoxPro), DB, MDB (Access), XLS (Excel), and WK4 together in a Multiple Document Interface window. Find phrases, letters and numbers in Database, Text and Document Files. Quick Color editing and resizing of pictures or images. Add Text and Shapes to pictures. Cut and paste sections of pictures and add to other pictures. Find and Play WAV, MID, RMI, WMA, WMV, AVI, MPG, MPEG, MOV, MP3, M3U, ASF, AIFF, MP2, and M1V files with Microsoft Media Player Component. Separate and multiple Play Lists for Music and Video Files. Some Image Editing features as Contrast, Brightness, Resize and Rotation. Copy areas of pictures between pictures and paste onto other pictures. File Utilities as Save As, Rename, Delete, Move, Copy, and File Properties Window. Quick Print of Pictures, Text, Documents, Database and Spreadsheet files that are viewable by File Viewer. Print a list of all occurrences of a file or searchable file types on your disk or CD Rom, and save in a Text File. Send Files you can find with File Viewer by E-Mail if you use a stand alone E-Mail Program as Outlook Express in Zip File. Receive Files over the internet by same E-Mail Control in Zip File Format. Organize any number of files in groups you create, and define in your own file database, with easy tabular viewing for quick location, and retrieval of frequently used files. Organize files over a computer network in a simple easy to access database. Click on a file in the database and open that file for viewing, printing or sending. Create a Database of your computer's files or files on another computer over the network. Sort and View Files by Name, Description, Search Word, and Groups you define. Organize your entire disk with one procedure, automatically grouping files as Pictures, Sounds, Music, Video, Text, Documents, Database, or Spread Sheets. View pictures on the internet and multimedia files on the internet, saving URL. Batch Rename, Copy, Move, Delete, and Zip files selected from multiple folder locations. Set your own colors for Windows, List boxes, Entry Fields, and ThumbNails. Complete Help Text and Quick Tips for easy program use. Window's Explorer Style Interface, and double click viewing of supported files. Find and UnZip Zip Files. Easily Zip Files for EMail and copying to CD Rom or DVD ! Imaging Functions built with LeadTools. 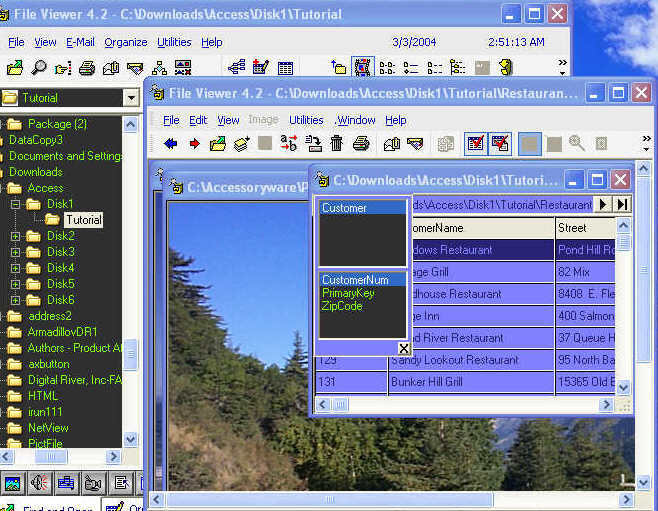 Supports Access 2000 / XP and Excel 2000 / XP Files ! Supports Adobe PDF Files !